Oil on board. 24" x 32"
Tod Lindenmuth, American,(1885 - 1976). ​​​​Born in Allentown, Pennsylvania, Tod Lindenmuth was a painter known for marine and landscape paintings. His heritage was Pennsylvania Dutch, and his father, Arlington Lindenmuth, was also a painter but made his living running a photography studio. Tod Lindenmuth studied with Robert Henri and was a member of the Salmagundi Club and the Rockport Art Association. Lindenmuth exhibited regularly at the Pennsylvania Academy of the Fine Arts (PAFA)from 1917-1933. He was also active in Provincetown, MA until 1941, and then retired to Florida in the 1960s, having spent his winters there since the 1930s. Lindenmuth described his "interest in painting as the arrangement of natural objects with contrasting color and form, plus design in a semi-abstract manner." 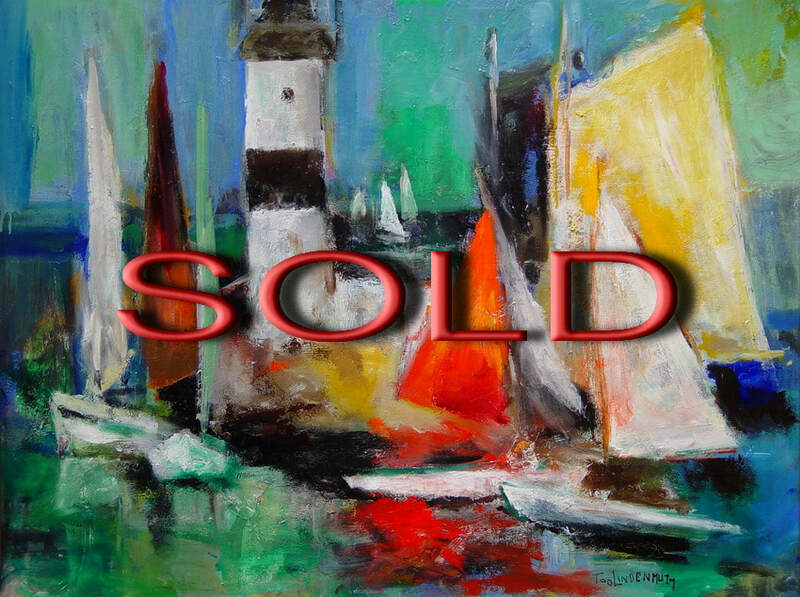 In this painting, Lindenmuth juxtaposes colorful sailboats against the backdrop of an impressive lighthouse, creating a modernist interpretation of classic marine scene.